Wanderlust isn’t easy to curb. Someone who loves to travel yearns for more with every photo they see of a far-away land, every story they’re told by a friend just back from a worldly adventure. There’s no way around it: you must go abroad to scratch the travel bug’s itch. Clare Snow, now a fourth-year student in biology and psychology, faced a decision many deliberate when they’re finishing up high school: start university right away or to take time off to travel first? She chose to attend university. “When I got here, it was always at the back of my mind. I kind of wish that I had have taken that time [to travel],” recalled Snow. 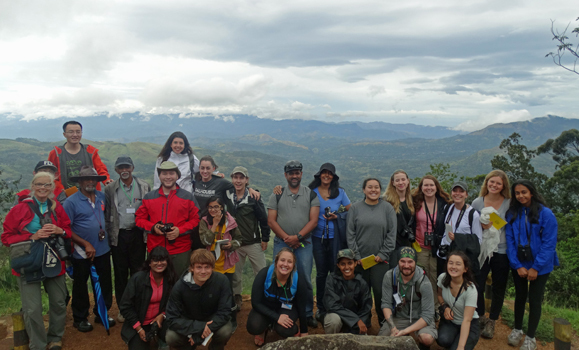 Luckily, the Faculty of Science’s SEASIDE Program offers a chance for students to combine travel and course credit through the Tropical Ecology and Biodiversity Field Class, which takes place in Sri Lanka. Snow signed up for the class the first day registration opened. This past summer, she and 16 other students attended tailored lectures and labs on campus in Halifax to prepare for 18 days exploring the island nation’s many ecosystems. “I never realized that I’d have an opportunity to do both at once—focus on my education while experiencing a new place and a new culture,” said Snow. Rajesh Rajaselvam, Arunika Gunawardena and Cindy Staicer, all with the Department of Biology, led students on the (study) trip of a lifetime. As an added bonus, the students got to experience the country like a local would because both Rajaselvam and Gunawardena are Sri Lankan themselves. All that work took place in a number of different environments abundant in flora and fauna: wetlands, mangroves, mountains, rainforests, dry plains and more. The conservation of critical habitats and wildlife was big part of the lessons too. Local experts like Gamini Hitinayake with the University of Peradeniya not only helped explain the science behind it all, but taught the students the importance of understanding both political and cultural climates when working in conservation. Snow’s interest in the field class wasn’t just about the desire to travel. She was also excited to learn from Rajaselvam again. 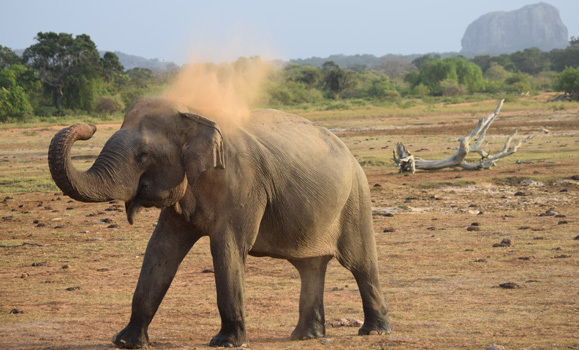 Snow described a packed itinerary full of “incredible experiences.” One standout happened in Yala National Park, home to wildlife like elephants, leopards, sloth bears, water buffaloes, and various birds and reptiles. For a student also taking the Certificate in Animal Behaviour, experiencing wildlife in a natural habitat adds to Snow’s educational goals. Sri Lanka was the first step. Now that she’s back on campus finishing her fourth year, she’s doing an independent research project on songbirds native to Nova Scotia with Staicer, one of her Sri Lankan field class professors. There was no shortage of photo opportunities during this field class. Professors and students captured many memories on this one-of-a-kind trip. View the gallery below. Cindy Staicer and Students viewing Sri Lanka’s rich wildlife from safari jeep in Yala National Park. The class tavelling through one of Sri Lanka's national parks. Students viewing Sri Lanka’s rich wildlife from a safari jeep in Yala National Park. Yala National Park boasts one of the highest leopard densities in the world. Students came across large lizards called water monitors. Students taking field notes for one of their assignments. Making new friends during field work. Rajesh Rajaselvam looking out over the Indian Ocean. Students also experienced the lush vegeation at elevation in Sri Lanka. Arunika Gunawardena and students plucking tea leaves in an upcountry tea plantation in Nuwara Eliya. Students trekking at high elevation in Horton Plains National Park, Sri Lanka. A sambar deer spotted in the montane forest of Horton Plains National Park.